Having already teased the gaming potential of the Samsung Galaxy Tab 3 7.0, we thought we would tease you yet again, and this time with some great news for those of you considering getting the tablet on Sprint. The US carrier has said they will offer an introductory price for the new Tab 3, although you will need to hurry. The Samsung Galaxy Tab 3 7.0 introductory price on Sprint is just $49.99, although this price does not include taxes. The new 7-inch version of the Tab 3 will be available on Sprint from October 11, this Friday. Those eligible for an upgrade or signing a new two-year contract can take advantage of this discount. This offer is not exclusive to just one Sprint channel, as all are taking part in the introductory offer, this includes Sprint Stores, online, and Telesales. You will be able to purchase the new tablet in white, although Sprint will release a new Galaxy Tab 3 7.0 color in time for the Holiday Season, which will be midnight black. Sprint does seem to be doing all it can to generate more customers, and this is surely a great way to do it. However, we also wonder if Sprint is offering the Samsung Galaxy Tab 3 7.0 for less than $50 because they know Apple is about to launch the new iPad mini 2 later this month? 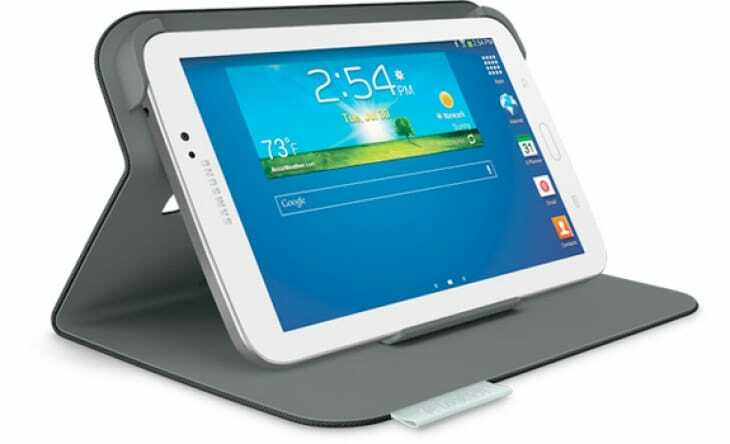 If you are considering taking advantage of this offer on Friday, then you might want to consider this Galaxy Tab 3 7.0 accessory to go with it. The Logitech Folio Protective Case is ultra thin and light, which means hardly no weight is added. The price for this extra form of protection is $49.99.